Radiology Associates of Hartford is excited to welcome Dr. Erik Bee as a staff radiologist. Dr. Bee graduated from the University of Connecticut School of Medicine before completing his residency at Tufts University School of Medicine Baystate Medical Center. He then completed the radiology residency program at the University of Connecticut and went onto complete their fellowship program in women’s imaging at Saint Francis Hospital. He also completed a vascular and interventional radiology fellowship at The Johns Hopkins Hospital. Dr. Bee specializes in women’s imaging, as well as vascular and interventional radiology. He’s also fluent in Polish. Welcome to the team, Dr. Bee! Radiology Associates of Hartford is excited to welcome Dr. Swapnil Bagade as a staff radiologist. Dr. Bagade graduated from Somaiya Medical College in Mumbai, India. He then completed a radiology residency at Tata Memorial Hospital and a registry radiology residency at Somaiya Hospital in Mumbai. In 2010, he came to the U.S. for an abdominal imaging fellowship program at Emory University in Atlanta. After completing that fellowship program, he moved to Saint Louis where he completed both pediatric radiology and nuclear imaging fellowships at Washington University. Dr. Bagade’s areas of expertise include pediatric imaging, nuclear imaging and brain imaging. He also co-authored a chapter on pediatric abdominal imaging for Roger’s Textbook of Pediatric Intensive Care. Welcome to the team, Dr. Bagade! Radiology Associates of Hartford is excited to welcome Dr. Michelle Romero as a new staff radiologist. Dr. Romero graduated from Rutgers University – New Jersey Medical School, she then interned at Saint Barnabas Medical Center in Livingston, New Jersey, before completing her residency in radiology at Rutgers University and a breast and body imaging fellowship at the University of Connecticut Health Center. Dr. Romero’s areas of expertise include breast imaging and minimally invasive breast procedures, CT, MRI and ultrasound body imaging. She also specializes in minimally invasive biopsy procedures including MRI-guided biopsies, Ultrasound-guided biopsies and Ultrasound-guided thyroid biopsies. She has also taught courses in women’s imaging at the University of Connecticut Health Center. Welcome to the team, Dr. Romero! 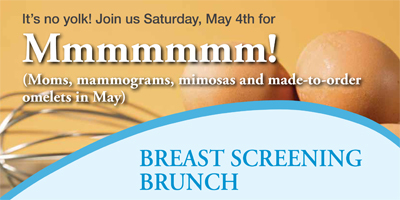 Enfield, Conn., May 1, 2015 — In honor of Mother’s Day, Radiology Associates of Hartford (RAH) is having a breast cancer screening brunch to help support the important women in everyone’s lives. Connecticut still has the unlucky distinction of having the second highest incidence of breast cancer in the U.S. As with any cancer, early detection is key. Regular yearly screening mammograms are the best tool for catching breast cancer at its earliest and most treatable stage. This event aims to make getting a mammogram more accessible by offering weekend appointments from 8:30 a.m. to 2:00 p.m. on Saturday, May 2 at RAH’s Enfield clinic – located at 9 Cranbrook Boulevard in Suite 102. This event also makes the yearly health chore of getting a screening mammogram into a celebration of women’s health. In addition to offering state-of-the-art mammograms, RAH will be offering free made-to-order omelettes, mimosas, manicures, mini makeovers, professional bra fittings, blood pressure checks and goodie bags. Because of the number of women who attend, pre-registration is recommended for the event and can be made by calling 860-714-2724. For more information about the Mother’s Day Breast Cancer Screening Brunch or services available at RAH, visit www.rahxray.com or call 860-714-2724. January 3, 2015 – Three years ago, Gordon Green, then 55, rejected his primary-care doctor’s suggestion that he get screened for lung cancer. But Green’s history of smoking a pack a day for 30 years and his doctor’s insistence changed his mind. And when his low-dose CT scan (LDCT) identified an early stage tumor in his left lung, Green underwent surgery at Lahey Hospital & Medical Center, a teaching affiliate of the Tufts University School of Medicine, Burlington, Mass. He has been cancer-free since. “It wasn’t so long ago that lung cancer was a death sentence,” he said. November 11, 2014 – Radiology Associates of Hartford provides FREE lung screenings for vets on Veterans Day. 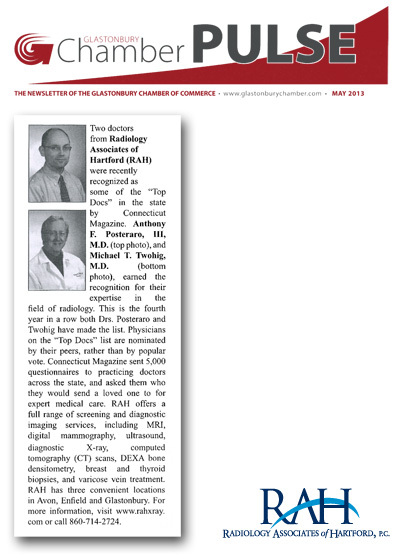 Spotlight on Radiology Associates of Hartford’s Dr. Posteraro in Diagnostic Imaging Magazine. November 6, 2014 – After finishing his radiology residency in 2004, Anthony Posteraro, MD, joined several major societies – ACR, RSNA, ARRS, and a few others. Membership dues were steep, but as a resident, he got a much-appreciated discount. Now a diagnostic radiologist in private practice at Saint Francis Hospital and Medical Center in Hartford, CT, Posteraro said he believes society membership is more critical these days than ever due to the healthcare overhaul and medicine moving from a fragmented to more unified system.